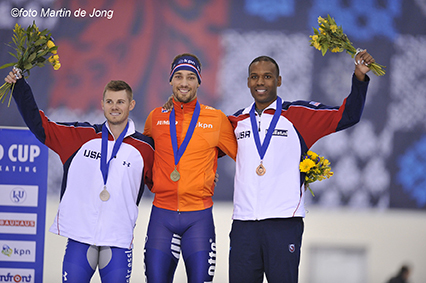 Shani Davis continues to show good form at the start of the new year. Racing on home ice at the superfast Olympic Oval in Salt Lake City, Davis picked up 1500m bronze, earning his first World Cup medal on the young season. Shani’s time of 1:42.90 was his best since 2013. The 18-time WC 1500m winner – tied for most ever – still holds the World Record of 1:41.04, which he set in 2009 at the Olympic Oval. At 1000m Shani posted his best time since 2012 (1:07.37) but it wasn’t enough to land on the podium, which was won by Russian Pavel Kulizhnikov (1:06.70), who set a 500m World Record (33.98) a day earlier. Kulizhnikov became just the third man to skate sub-1:07, a feat Shani has accomplished four times, including the 1:06.42 World Record in 2009. The two-time Olympic Champion and 10-time World Champion remains in the hunt for the season World Cup podium, improving to 4th in both the 1000m and 1500m overall standings. After a week of rest Shani heads to Europe for the last two World Cup events of the fall season.